It’s fairly easy to decide whether you need to call in an emergency plumber or an emergency builder. It isn’t so obvious if you need to call an emergency electrician. Deciding if you have a major issue or something that can wait for a regular electrician to visit. One of the easiest ways to decide is not from the fault but from the situation. 1. Smoke, sparks and smells. Smells can be the first indicator that there is a serious fault with your wiring. Something is getting hot enough to melt or char insulation. If a socket, switch or other fitting connected directly to mains electricity smells when it is in use (even more so if it is not being used), something major is wrong. Sometimes, electrical appliances can spark when switched on or off, however if the spark is large, or trips the circuit breaker, then there is a big problem. We don’t really need to warn you about smoke from fittings and fixtures … or do we? In all of the above situations, switch of the supply at the consumer unit and call us straight away on 0208 406 9834. 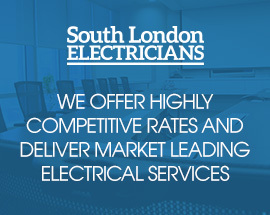 An emergency electrician from South London Electricians could be at your Earlsfield electrical emergency in minutes. Armed with state of the art diagnostic equipment, they will find and repair the electrical fault quickly and without fuss. All of our team are local to south London and know the best short-cuts that will get them to your Earlsfield home a little bit faster. It is common knowledge that ‘water and electricity don’t mix‘. Unless it has been distilled or de-ionised, water will conduct electricity. Water can flow along joists and other structural features for long distances. That means it will almost certainly have met your electrical wiring at some point. So, iIf you have had a water leak, you really should call out an emergency electrician who will determine where this has happened and make safe any damage. When decorating or doing a bit of DIY in your Earlsfield home, it is quite possible that you could come across some exposed wiring, for example, when you remove wallpaper. It is also possible that a previous owner of your house has covered up an unused fitting, leaving the core of the wires exposed. Even worse would be to discover naked wiring, without insulation, for example, where there is a wall light fitting or power socket. As well as these situations, if one or more circuit breakers suddenly start to trip for no apparent reason, that needs investigating urgently too. 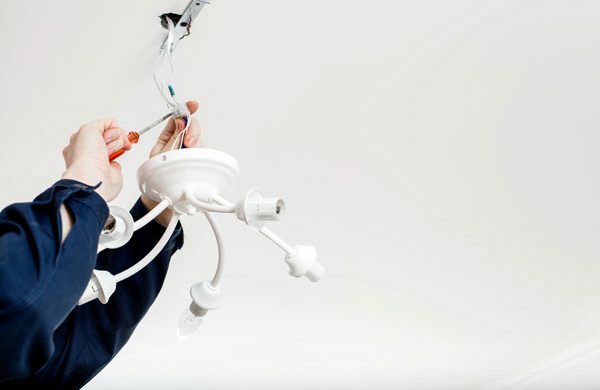 We aim to repair electrical faults on a ‘one visit’ principle – our electricians all carry an extensive range of spares and cables in their vans to make this possible. Half of our vans are electrically powered, so if your electrical fault becomes apparent in the small hours, our arrival is unlikely to disturb your neighbours! We are well known for the neatness of our work and how thoroughly we clean up after or intervention. Just take a look at the comments on Checkatrade, you will soon see what we mean. All our emergency electricians have many years of experience and are well-qualified to solve your problem at anytime of day or night, on any day of the year. If you need an electrical problem solving quickly, call us. You will reach an electrician straight away, not a receptionist, not a call centre. You benefit from only needing to describe your electrical fault once and less time waiting for the emergency electrician to arrive. Not only are we registered with Checkatrade, but also NICEIC who constantly monitor our work standards. This means that you know exactly what you will get – fixed rates with no hidden costs, an electrician who is respectful of your Earlsfield property, fully qualified, trustworthy and a rapid service. All of our work is guaranteed and we are fully insured. You benefit from peace of mind that your electrical emergency is not being dealt with by a ‘cowboy’ outfit. We have both domestic and commercial emergency electricians available in all areas of south London, not just the Earlsfield (SW18) area, and can therefore quickly resolve any emergency electrical problem – consumer units, 3-phase supplies, lighting issues, faulty wiring and more.